AVA provided Construction Management services with responsibilities for Inspection, Safety, Field Engineering and other services. The project consisted of bridges, underpass roads, trackwork, retaining walls, sound walls, landscape, park restoration, drainage, power/communications ducts and a host of other restoration work. 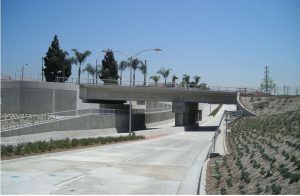 The Ramona Grade Separation Project, located in the city of El Monte, required Ramona Blvd. to be lowered approximately twenty-six (26) feet below the railroad tracks. The project required construction of temporary shoofly for uninterrupted revenue operations of the railroads prior to the construction of two (2) railroad bridges. One bridge was for the Union Pacific Railroad, and a second bridge for the Metrolink Commuter Rail system. UPRR bridge superstructure was built of steel girders, while the Metrolink Bridge used prestressed concrete box girders. Both bridges are supported by 60 inch diameter CIDH piles extending to over a 100 foot depth. An underpass access road along Ramona Boulevard was built utilizing Caltrans standard construction guidelines and details, and this included RC retaining walls on CIDH piles, sound walls (per Caltrans standard), a pump station for flood control & prevention, median and mitigation landscape with a drip irrigation system, restoration of an adjacent park, dedicated pedestrian walkways, road signage, traffic signals, road striping, storm drainage, water piping system, relocation of power and communication ducts/cablings, and installation of new curbs, gutters, and sidewalks per public works standard (Greenbook), and the city of El Monte.